Microsoft has released a technology preview version (in other word: beta) of Windows DreamScene via Automatic Updates and Windows Update (or Microsoft Update). If you’re Windows Vista Ultimate users, you can download Windows DreamScene for free now. Windows DreamScene, thought to be the killer applications that will entice Vista users to upgrade to Vista Ultimate edition, is not available when the first batch of Ultimate Extras was launched, which includes BitLocker stuffs and Texas Hold ‘Em poker game, although it’s been heavily promoted during Vista CES launch. Windows DreamScene preview allows Vista Ultimate users to set and play MPG or WMV movie files as an animated desktop wallpaper, commonly called motion desktop. The beta version of Windows DreamScene has actually leaked on the P2P networks for a while, so the official release from Microsoft by Windows Update (WU) is kind of for those who afraid about the authenticity of leaked version. Windows DreamScene can be downloaded via Windows Update. 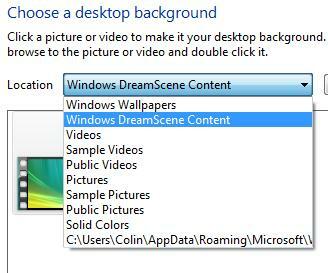 Once installed, you can enable DreamScene through the Desktop Background section of Personalization. After Windows DreamScene is enabled, you can actually just right-click a video file of the supported type or format (MPG and WMV) and set it as your desktop background with DreamScene. You can also pause and play the video on DreamScene’s motion desktop, just like how you pause and play again the movie on DVD. Right click on your motion desktop and choose “Pause DreamScene” or “Play DreamScene” to stop and continue playing the animated wallpaper.